The Article: To at Least One Earthling, Siberia Meteor Proved That Science Is Vital by Clyde Haberman in The New York Times. The Text: Twice on a recent Friday, the cosmos intruded rudely on us earthlings. A meteor exploded over western Siberia, shattering windows, injuring hundreds and scaring pretty much everyone else. That same day, an asteroid passed within 18,000 miles of us, close enough to arch many an eyebrow among astronomers. One earthling, at least, looked on the bright side. A warning that the planet could be imperiled has a way of focusing the mind wondrously. So we asked about a huge asteroid called Apophis, whose name alone ought to give one pause. The possibility of planetary cataclysm was not on our agenda when we invited Dr. Tyson to break bread. The original question was simpler: Could the latest brushes with asteroids get people thinking about the universe more, well, cosmically? Dr. Tyson — Bronx-reared and, as he likes to point out, born in the same week in 1958 as NASA — is given to speaking not in whole sentences but, rather, in whole paragraphs. He has a gift for putting the fizz in physics and taking the sigh out of science. Chances are he is no stranger to you. He is a television semiregular. Dr. Tyson even turned up, in illustrated form, in the January issue of Action Comics, identifying a plausible location in the real cosmos for Krypton, which had been Superman’s home planet. He theorized that Krypton could have orbited a red dwarf star in the Corvus constellation, 27 light years from Earth. That’s roughly 160 trillion miles away, in case you are thinking of a trip. These days, Dr. Tyson is less focused on the planetarium than on creating a new iteration of “Cosmos,” the hit PBS series featuring Carl Sagan, which was first broadcast in 1980. This sequel, for the Fox network, is planned for early next year. Here’s the real problem, as he sees it: “You have people who are not scientifically literate who have risen to positions of power and control,” whether on local school boards or in Congress. He mentioned Representative Paul C. Broun, a Georgia Republican (and doctor) who sits on the House Science Committee and who says the world is 9,000 years old and was literally created in six days. With all due respect to Galileo, he does not top Dr. Tyson’s list of science greats. “The first person I would meet the day a time machine gets invented” is Isaac Newton, he said. 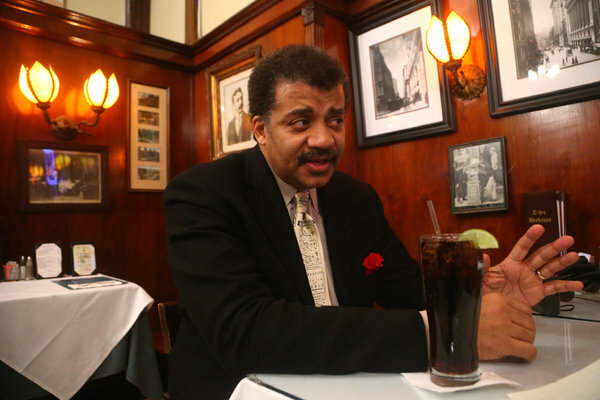 On this afternoon, Dr. Tyson wore a pale yellow tie emblazoned with Newton’s image. It instantly caught the eye, as did a red rose tucked into the breast pocket of his jacket, a souvenir from a luncheon that day. The rose was in itself both a science lesson and a reminder of the planet’s fragility.